On December 1, 2017, four Warrior students will travel to Denver to witness former Pueblo student Lafayette “Fat” Lever’s “Retiring of a Jersey” (No. 12) ceremony, accompanied by exceptional education teacher and yearbook advisor Ms. Marie Little and Assistant Principal Frank Rosthenhausler. Students may know that Pueblo has a “Lever” Gym, but sadly, many of our current Warriors do not even know Lever about his legendary status—how remarkable this Warrior was back in his high school days and how nationally acclaimed he would become well into the 1990s. Lever began playing for the Denver Nuggets from 1984-1990, and during those seven seasons, he averaged 17 points, 7.6 rebounds and 7.5 assists. A two-time “All Star”, Lever ranks first all-time in franchise history in steals (1,167), second in assists (3,566), seventh in points (8,081) and eighth in rebounds (3,621). 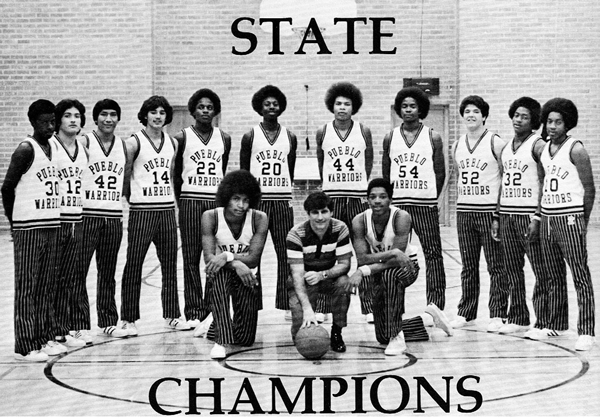 And to think that this former all-star basketball player got his first taste of fame here at Pueblo during two very definitive basketball seasons: 1976-77 and 1977-78; Pueblo’s varsity basketball teams were State Champions for two consecutive years. Today, Lever Gym boasts these victorious seasons with banners that will definitely stand the test of time. Math teacher Ms. Martha Avila-Miranda was a senior when our varsity Warrior basketball team won their first State championship. Fat Lever pictured to the right of Coach Lavetter. 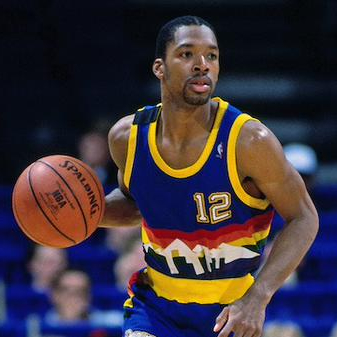 By the time Lever arrived in Denver in 1984, the Nuggets were in desperate need of a miracle. That came in the 1985 season—when Lever helped the team advance to the Western Conference finals. Although the team would lose to the Los Angeles Lakers in five games, this season would prove to be the Nuggets’ most successful. Although Lever played for the Dallas Mavericks from 1990-1994, Lever affirmed in several interviews that his heart was always with the Denver Nuggets. Due to several knee injuries and other circumstances, Lever retired from the NBA in 1994. Lever later become a broadcaster for the Sacramento [California] Kings from 2007-2014, and eventually he returned to Arizona—Chandler, specifically—where he is currently a consultant in sports and international business. He also works with the Junior NBA program. Our four Pueblo students—one from each of the media programs (radio, television, journalism and yearbook)—will have the privilege of witness Lever’s jersey being officially “retired” during a halftime Nuggets game on Saturday, Dec. 2. 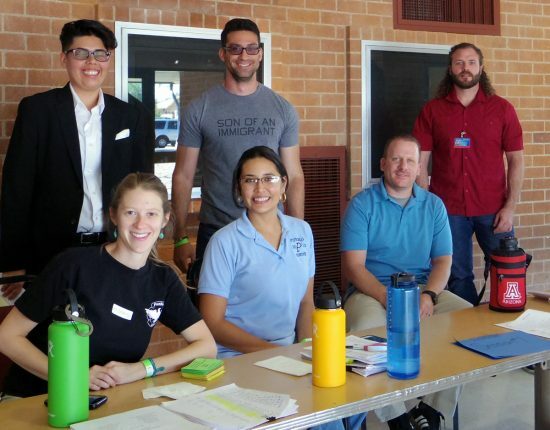 After two weeks of raising enough money for airfare through many generous donors—and through a lot of tenacity and perseverance!—our Warriors depart from Tucson International Airport at 6 a.m. and will return to Tucson Sunday morning. Yearbook student Andrew T. Romero, a junior, is the representative from his class and was very instrumental in initiating this trip. Back in October, Romero’s yearbook teacher, Ms. Marie Little, announced to her class that Lafayette (“Fat”) Lever’s jersey was going to be retired at a Denver Nuggets on Dec. 2 and that it would be a great opportunity for several of our Pueblo media students to travel to Denver and interview Lever and be a part of this historical sports moment. 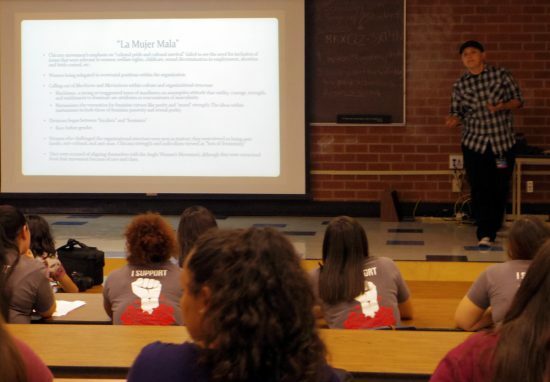 From there, Romero had a conversation with former assistant principal Eduardo Nuñez (who was also a 1960 Pueblo High School graduate), who contacted Lever regarding Lever’s retirement celebration and getting Pueblo students there for this event. From there, Lever contacted Little—and Lever was able to get six media passes to the Dec. 2 Nuggets game. Lever is also taking care of our Warriors’ hotel costs for two nights. 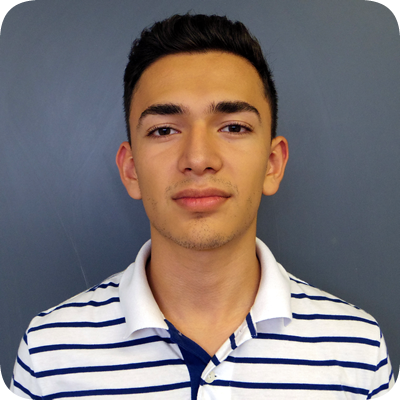 Romero approached Pueblo Principal Dr. Augustine Romero about this proposition and got his “thumbs up”. 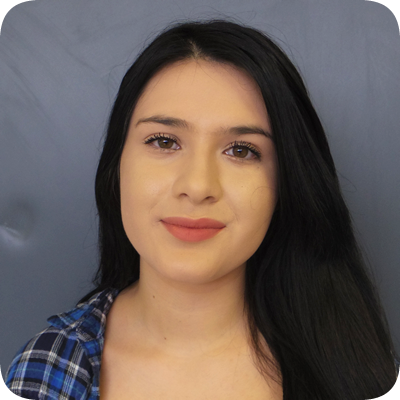 Junior Laura Conde, advanced journalism student, learned that she was going after editor-in-chief Iram Arce turned down the opportunity because he had “absolutely no interest in basketball.” Therefore, journalism teacher Mr. Rana Medhi selected Laura because of her excellent journalism skills. Radio student Marissa Orr, a senior, “When Ms. Wilson told me to go outside with Ms. Little, I thought I was framed or something. But, then I found out that I was selected to be the representative of radio to travel to Denver. This is an awesome opportunity for me—and I feel honored and privileged to have been selected by Ms. Wilson to represent radio. Little said that in just eight days, she and the four students were able to raise $2,385—much of which came from current and former Pueblo faculty and staff members. “We are beyond overwhelmed by the generosity of the Pueblo community,” Little said. Rosthenhausler added that he was a bit skeptical at first regarding the prospect of Ms. Little and students raising money for the air fare. The entire Pueblo community anxiously awaits the students’ return to Pueblo to hear the highlights of this historical moment in sports history. The fact that Lever began his rise to athletic stardom and legendary sports acclaim right here at Pueblo makes this story even that much more powerful. You’ve seen them around campus: pictures of Mr. Cristobál Santa Cruz adorned on the black t-shirts. 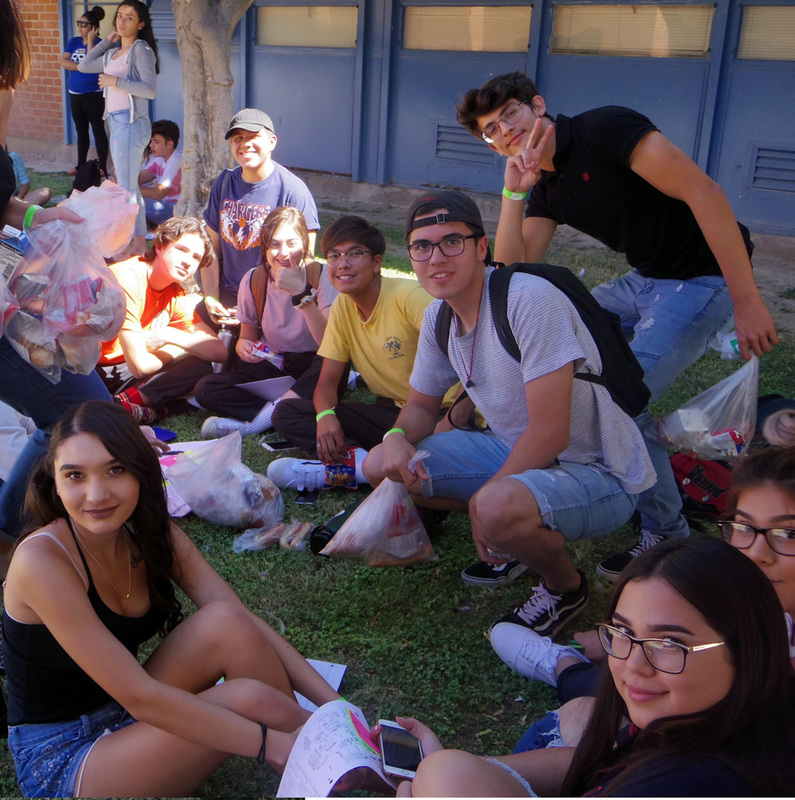 About 30 seniors were inspired to create them after being in Santa Cruz’ AP U.S. history class last year. Some of these class of 2018 seniors are very particular about when they wear these “Santa Cruz” T-shirts. 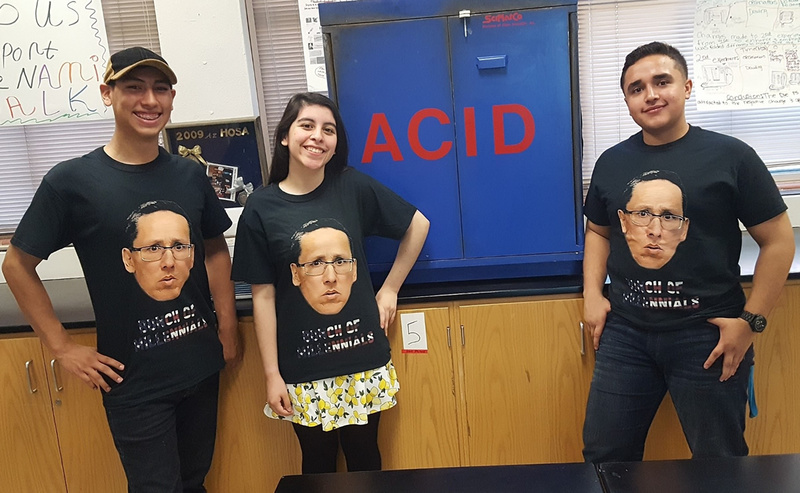 At first, the idea for the T-shirts was just a joke that the senior trio Lydia Angulo, Iram Arce and Brianna Metzler had made. “It was just a joke and we even made a fake advertisement and emailed everybody about it,” said Arce. However, the shirts were such a big hit with many of the students and teachers that shirt requests were starting to come in quicker than expected. 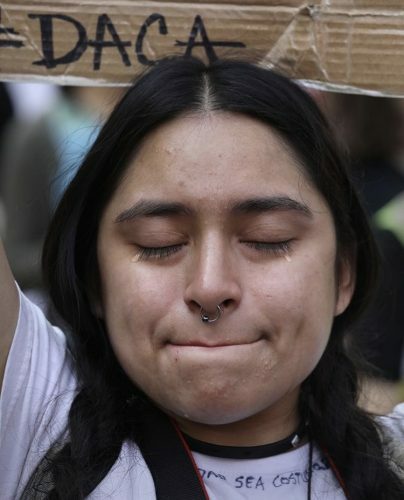 “We had about 30 people order a shirt including Dr. Gonzalez and Santa Cruz’ wife,” said Arce. “We began to see this as a means of marking a ‘historic’ event that will leave a legacy for future generations,” said Metzler. Look In The Sky…It’s A Bird…It’s A Plane…No, It’s Our Drone! On March 29, 2017, during 4th period (and first lunch for some), Pueblo’s CTE Graphic and Web Design teacher, Mr. Ernesto Somoza, gathered all of the spring sports girls’ teams—including soccer, basketball, volleyball, softball (as well as Cheer)—to celebrate their upcoming “AIA Tony Komadina Award” with a group picture. 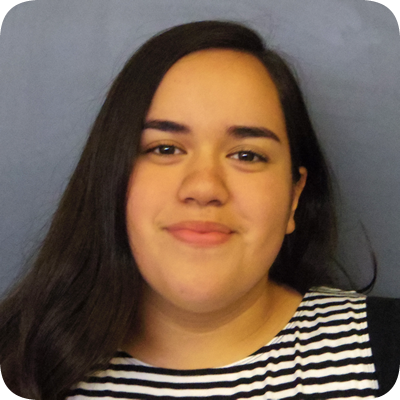 Sophomore (Class of 2019) Yazmin Almazan, a member of the girls’ JV volleyball team this season, said that she felt a sense of unity with the other girls at Pueblo, and she loved the drone! “The drone took some very unique shots of us—pictures that a person would never be able to take. I hope that the drone is used again to take more interesting pictures,” Almazan said. 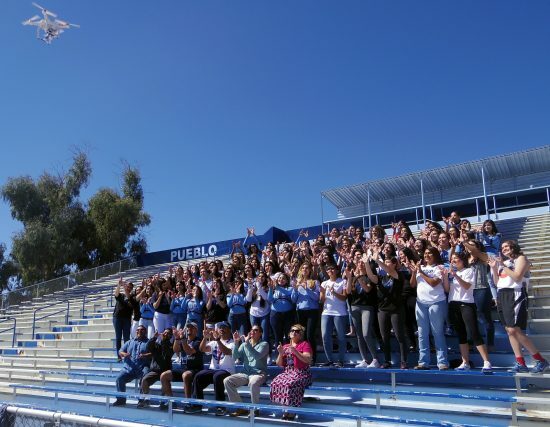 Posted on May 11, 2017 November 14, 2017 Categories Around Campus, Athletics, Awards, CTE, Drone, Only At Pueblo, School Awards, VideoLeave a comment on Look In The Sky…It’s A Bird…It’s A Plane…No, It’s Our Drone! On Dec. 16, 2016, Pueblo Magnet High School held its grand opening to commemorate the school’s first clothing bank, in the former T-5 building, offering a enormous variety of shoes, clothes and accessories for boys and girls—as well as adults—in need of these items. The clothing bank also teaches Pueblo’s CBI students special job skills including sewing, ironing, working with the cash register and stocking items regularly. 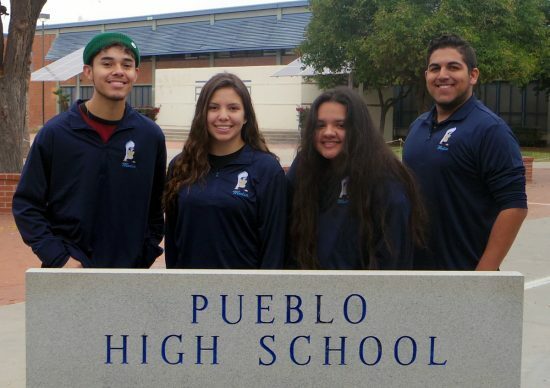 “It’s challenging for our CBI students to get jobs, so we’re offering opportunities to build on their resume of skills,” said Ms. Trevia Heath, who is Pueblo’s Exceptional Education Coordinator. Everything in the community bank was donated by teachers, staff and students. All working items are then washed, ironed, and hung in the clothing bank racks. 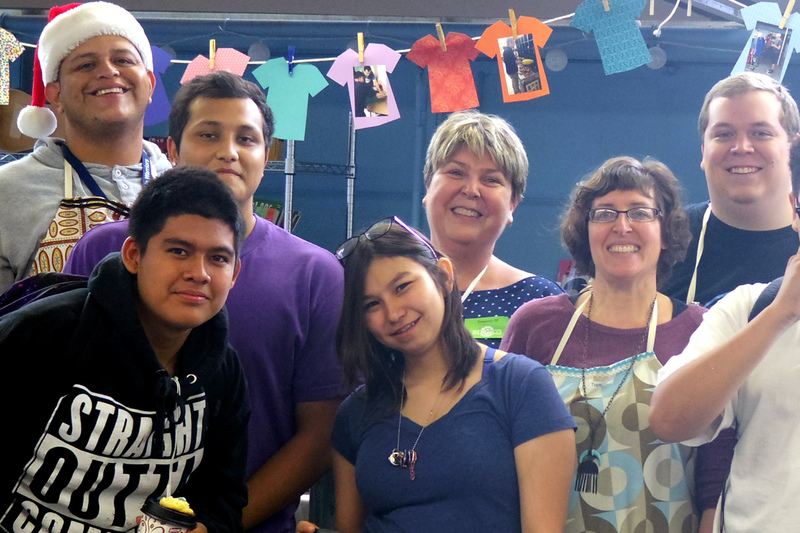 “If it needs to be washed, vended or sewed, we teach our students how to fix it,” said Heath. Health acknowledged many Pueblo individuals for making the clothing bank a reality—and especially the following: Ms. Rhonda Alexander, Mr. Derek Gunnels, Ms. Jamie Hogue and Mr. Miguel Sandoval. Mariñez said that she will be one of the workers in the clothing bank. 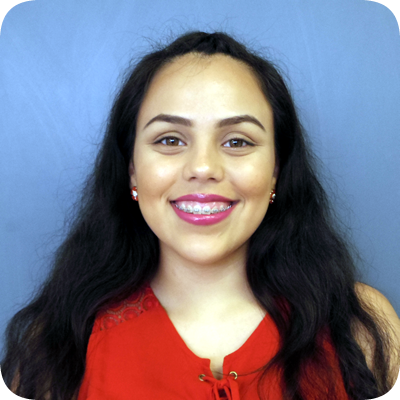 She said that she is looking forward to her training—learning how to be a cashier, a stocker and anything else that needs to be done. Heath said that many individuals made this clothing bank possible, including: Dr. Augustine Romero (principal) and the rest of the administrative team; TSW staff members; Tucson area businesses (Cathey’s Sew and Vac, Home Depot, Office Depot and Lowe’s Home Improvement) as well as the entire Pueblo community, including parents, who have been “beyond generous,” Heath said. The clothing bank owes its existence to the WIOA (Workforce Innovation and Opportunity Act), who approved the $10,000 grant which was used to buy racks, hangers and sewing machines—among other items necessary to making the clothing bank a reality. Students in need of any sort of clothing item or accessory can simply talk to the teachers, who then refer them to the TWS staff. She added that if a grant gets approved for next year, her plan is to open a greenhouse near the Science Club’s garden. “This [garden] could definitely give students a chance to learn agricultural skills and add to their resumes,” Heath said.